Adolph von Menzel (1815–1905), The Iron Rolling Mill (1875), oil on canvas, 158 x 254 cm, Alte Nationalgalerie, Berlin, Germany. Wikimedia Commons. It was a long time before painters paid much attention to the working man and woman. When the Industrial Revolution swept through Europe during the latter half of the eighteenth century, a few artists were sufficiently moved by its visual effects as to commit them to canvas. Joseph Wright of Derby was less interested in the people at work in new industries, and more fascinated by their new science and technology. 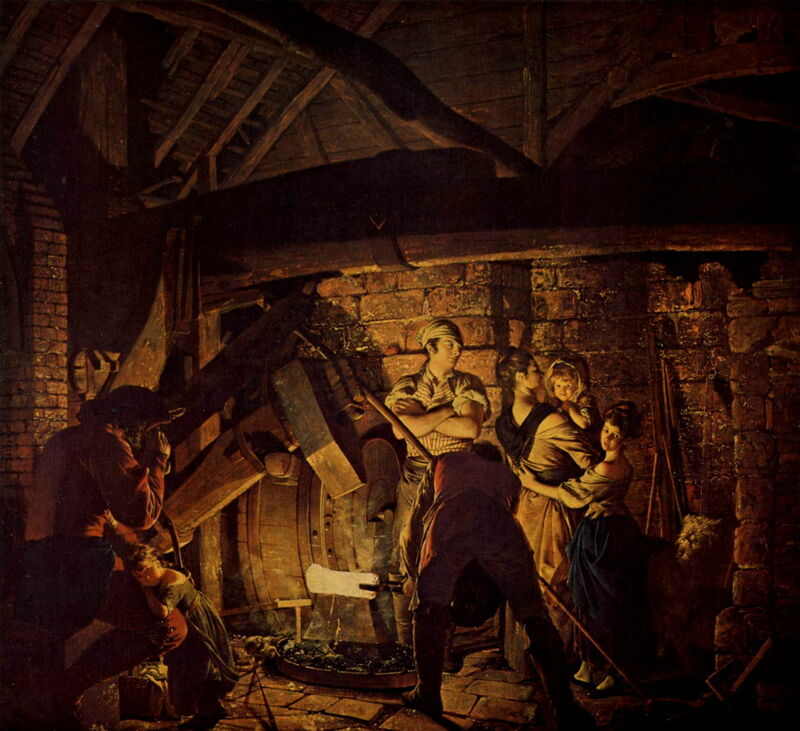 An Iron Forge (1772) is one of his series of paintings which were both commercially successful, and accurate portrayals of the comparatively small-scale technological advances of the early decades of the revolution. 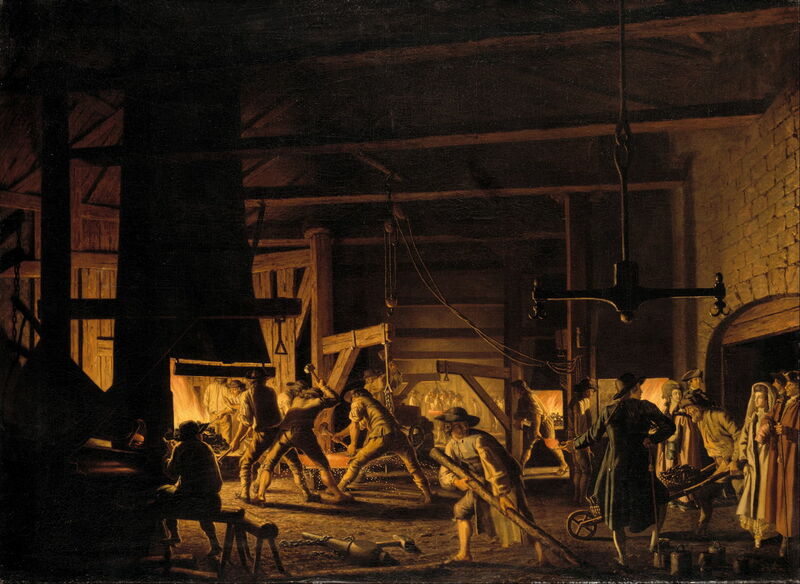 It shows a group of workers forging a white-hot iron casting, using a tilt-hammer powered by a water-wheel. Also present is the wife and children of the iron-founder, stressing the family nature of these small forges at the time. Pehr Hilleström (1732-1816), Anchor-Forge at Söderfors. The Smiths Hard at Work (1782), oil on canvas, 137 x 185 cm, Nationalmuseum, Stockholm, Sweden. Wikimedia Commons. A decade later, Pehr Hilleström recorded a visit to the Anchor-Forge at Söderfors. The Smiths Hard at Work (1782). As with many of these early glimpses of new industries, his painting shows a well-dressed group of visitors, at the right, who are watching the workmen in the centre. Söderfors is in Uppsala, on the east coast of Sweden, and seems to have been an early industrial site. Philip James de Loutherbourg (1740–1812), A View near Matlock, Derbyshire with Figures Working beneath a Wooden Conveyor (1785), oil on canvas, 90.5 x 144.8 cm, Yale Center for British Art, New Haven, CT. Wikimedia Commons. The greatest of the painters of the early part of the Industrial Revolution was Philip James de Loutherbourg, a landscape artist who started painting the small-scale industrial sites which sprung up around towns. 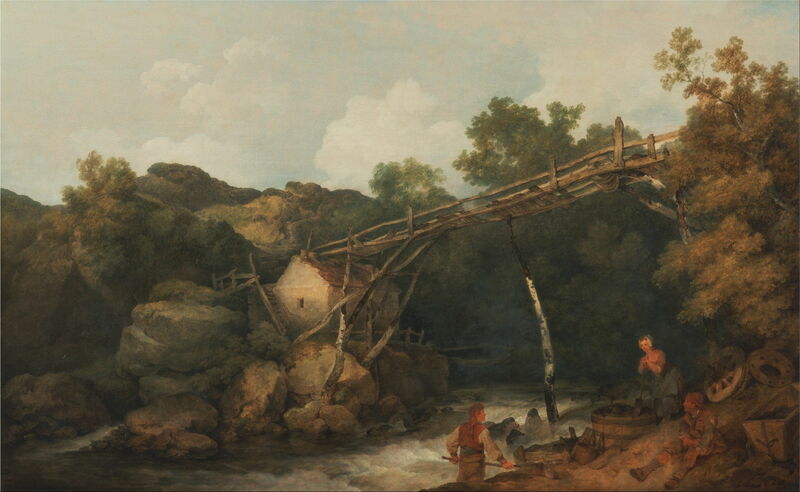 Typical of these is A View near Matlock, Derbyshire with Figures Working beneath a Wooden Conveyor (1785). 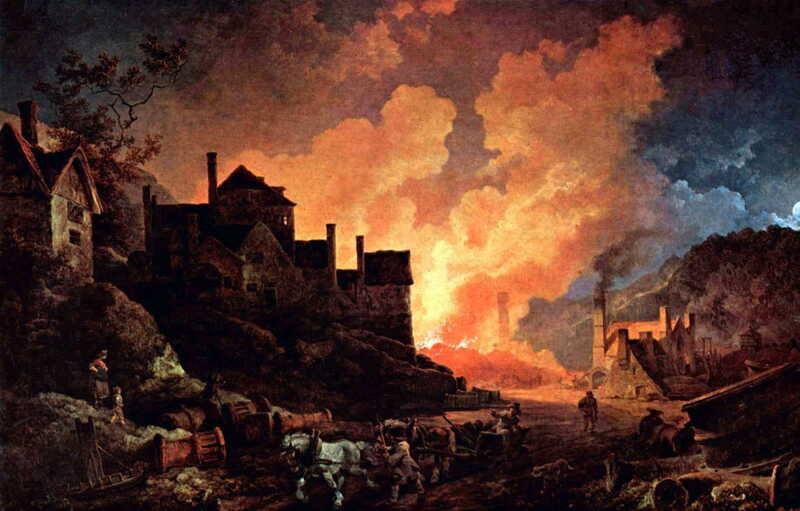 De Loutherbourg also painted one of the most sublime and enduring images of the industrial revolution, in his Coalbrookdale by Night (1801). 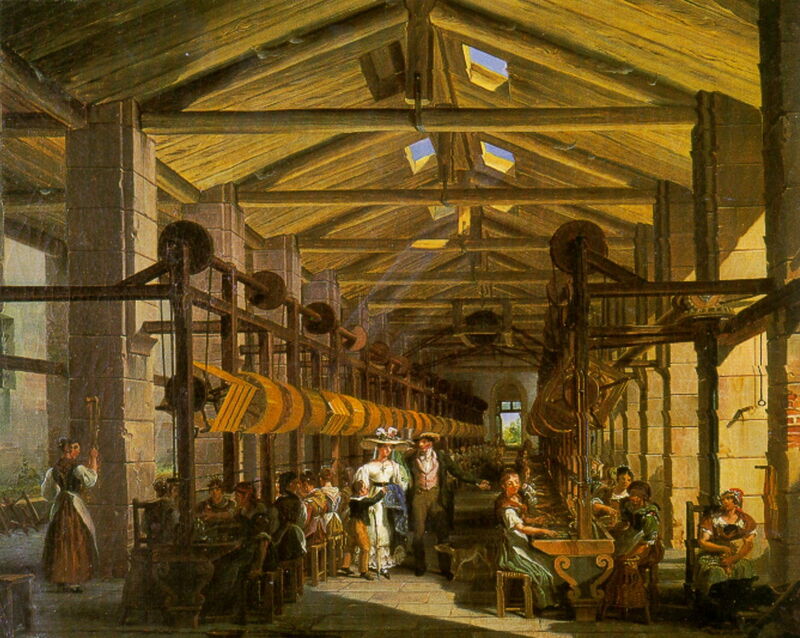 Giovanni Migliara (1785–1837), Mylius Spinning Mill (1828), media and dimensions not known, Pinacoteca Civica di Alessandria, Alessandria, Italy. Wikimedia Commons. With men working in the heavier industries, women were put to work in the fabric mills. Giovanni Migliara’s Mylius Spinning Mill (1828) shows a visit by a well-dressed and obviously affluent woman and her family, as the workers toil at their labour. George Childs (1800-1875), Dowlais Ironworks (1840), further details not known. Wikimedia Commons. Industrial development rapidly swallowed what had previously been agricultural land across Europe and America. 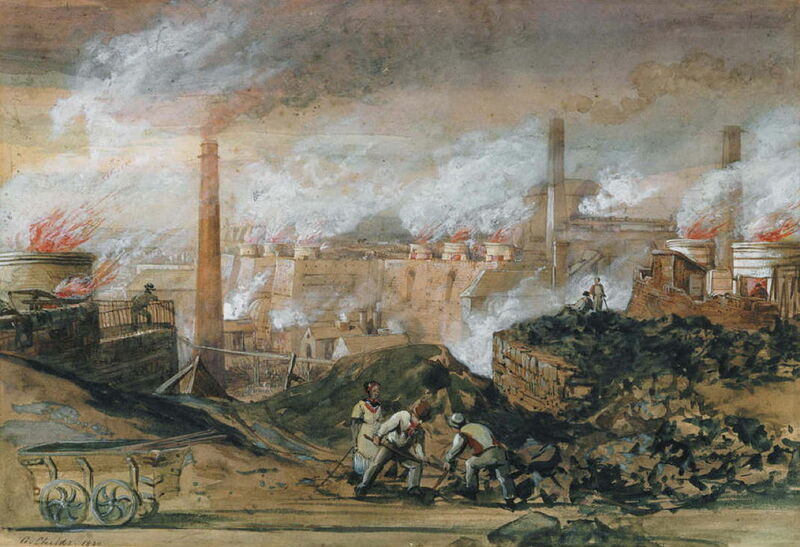 George Childs shows the consequences in a series of paintings of South Wales, including this one of Dowlais Ironworks (1840). This site at Methyr Tydfil, South Wales, opened as a single iron furnace in 1760, and by the time that Childs painted this was providing iron for the railway tracks which were spreading throughout Britain and much of Europe. It operated eighteen blast furnaces, employed over seven thousand people, and produced over 80,000 tons of iron each year. William Armstrong (1822–1914), Toronto Rolling Mills (1864), further details not known. Wikimedia Commons. Large-scale iron production also started in North America. In 1857, investors opened a site for the production of iron primarily for the growing railways across Canada, and a few years later William Armstrong painted those Toronto Rolling Mills (1864). By this time, it was the largest iron mill in Canada, and the largest manufacturing industry in the city, but it was soon surpassed by steel mills and shut down in 1873. John Ferguson Weir (1841-1926), The Gun Foundry (1866), oil on canvas, 118.1 x 157.5 cm, Putnam County Historical Society, Cold Spring, NY. Wikimedia Commons. 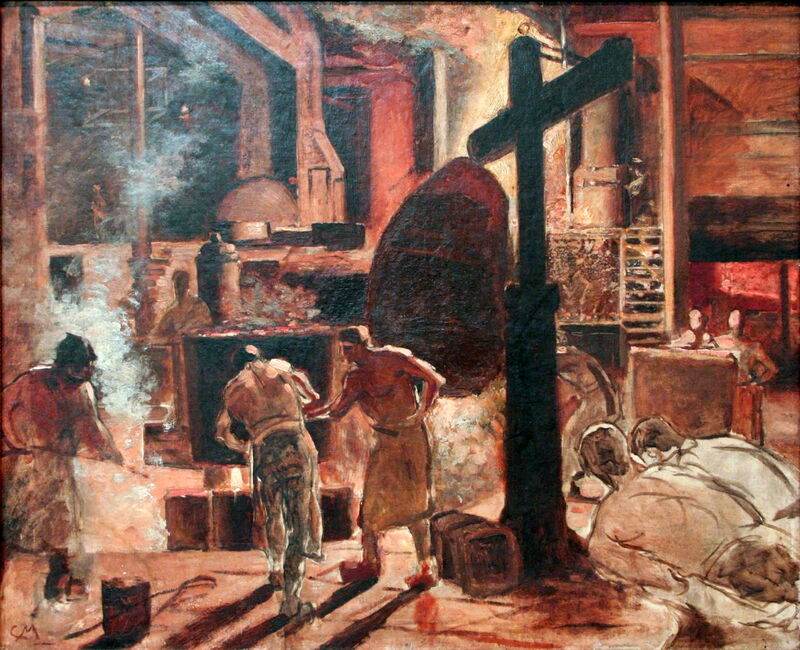 John Ferguson Weir took his rather dark realism before an unusual motif for American painting at that time – the hot, harsh, and dangerous world of the West Point Iron and Cannon Factory, in The Gun Foundry (1866). The moment shown is the casting of a Parrott Gun, in the foundry responsible for making most of the large guns used by the Union forces during the Civil War. 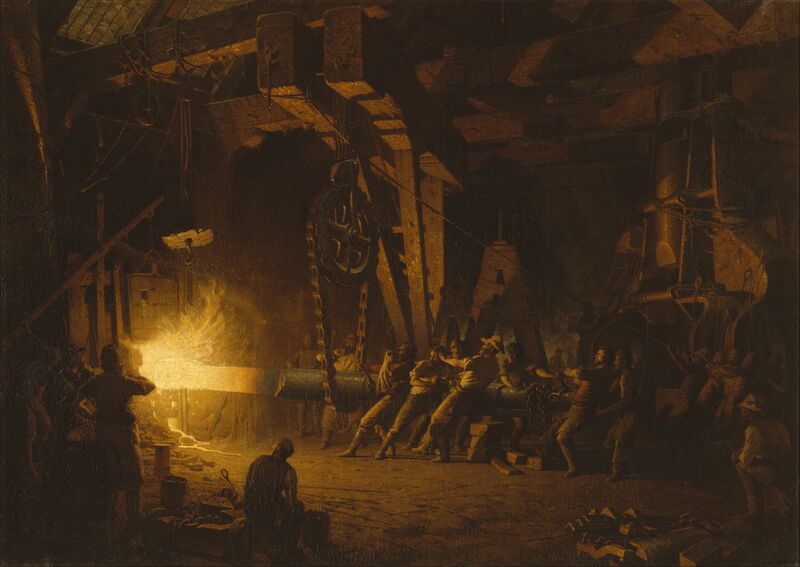 John Ferguson Weir (1841-1926), Forging the Shaft (1874-7 after original of 1868), oil on canvas, 132.1 x 186.1 cm, The Metropolitan Museum of Art (Purchase, Lyman G. Bloomingdale Gift, 1901), New York, NY. Courtesy of The Metropolitan Museum of Art. Weir’s Forging the Shaft is a replica which he painted in 1874-7, after the original of 1868 was destroyed by fire. It shows the same foundry, this time working the massive propellor shaft for an ocean liner, more a symbol of peace and trade than past conflict. 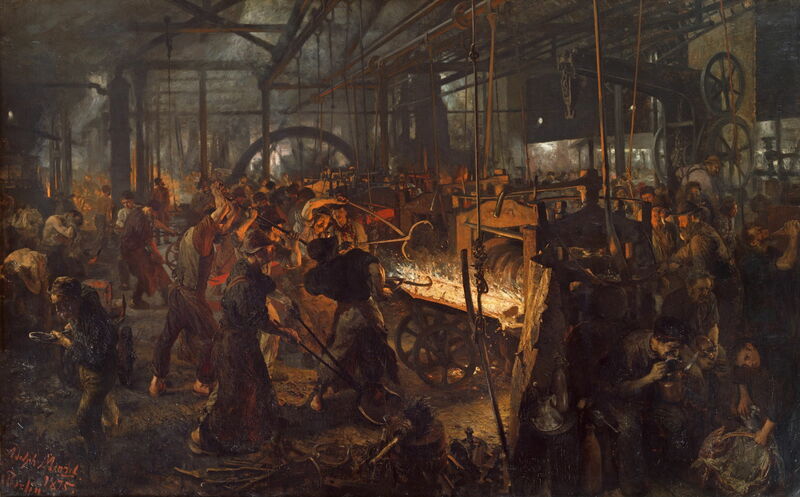 Adolph von Menzel’s The Iron Rolling Mill from 1875 gives a good impression of the crowded, sweaty, and dangerous environment in which iron and steel workers spent much of their lives. 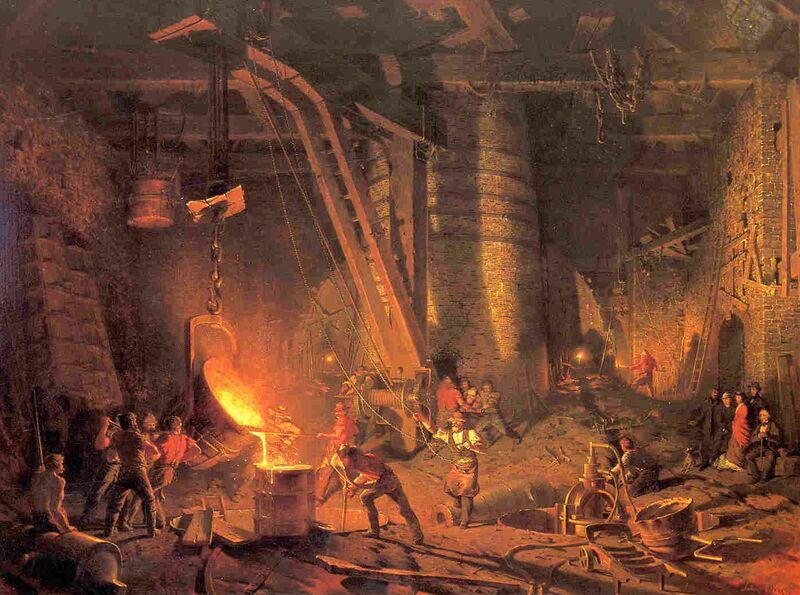 Production of steel on an industrial scale started after 1857, with the introduction of the Bessemer Process. 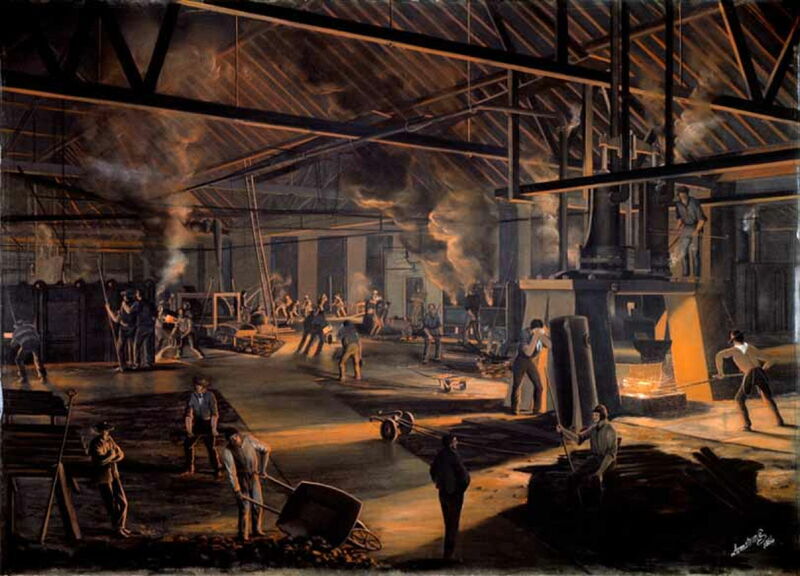 Constantin Meunier’s undated Steel Foundry must therefore have been painted during the 1860s or later. 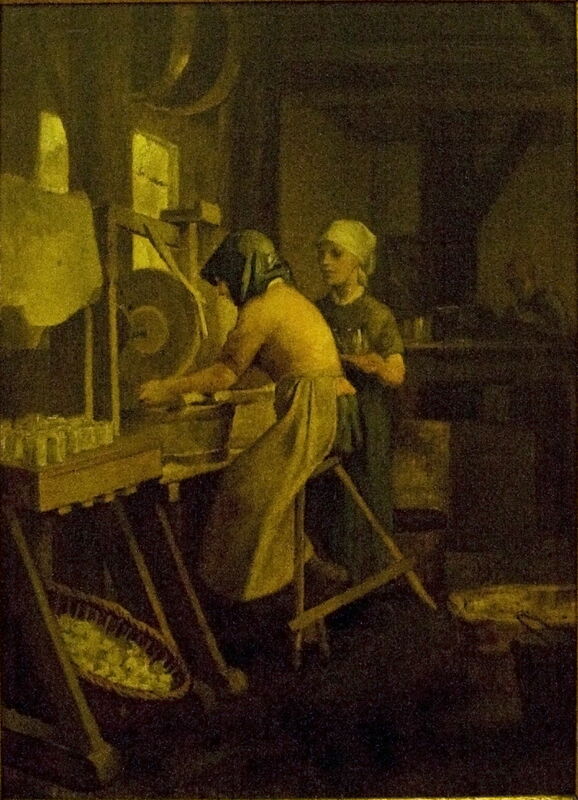 Meunier’s undated Women Working in a Glass Factory shows an example of the factory work which employed many women. It is also a good indicator of the trend in painting during the late 1870s, which turned attention from the industry to its workers. Alfred Sisley, Forge at Marly-le-Roi (1875), oil on canvas, 55 x 73.5 cm, Musée d’Orsay, Paris. EHN & DIJ Oakley. Although there are several well-known Impressionist paintings of factories belching smoke into the French countryside, the French Impressionists showed little interest in either heavy industrial processes or their workers. 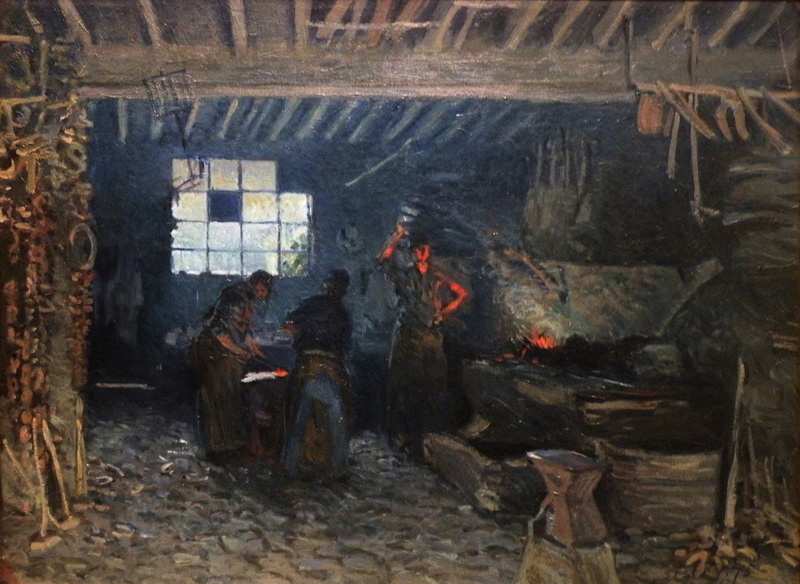 One of the few examples is Alfred Sisley’s Forge at Marly-le-Roi (1875), which shows a smaller-scale and more traditional sight. Max Liebermann (1847–1935), The Preserve Makers (1879), oil on mahogany wood, 49 × 65.3 cm, Museum der bildenden Künste, Leipzig, Germany. Wikimedia Commons. Where the factories and works didn’t completely take over the countryside, lighter industries invaded more traditional agriculture. 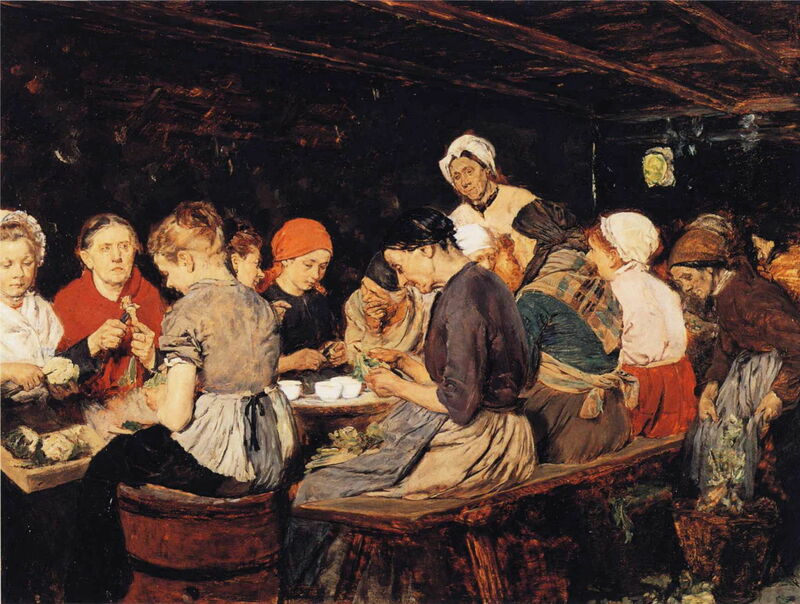 Max Liebermann’s The Preserve Makers (1879) shows a shed full of country women preparing foodstuffs for bottling and canning; the latter gradually came into use after 1810, but didn’t become popular until the First World War. Posted in General, Life, Painting, Technology and tagged Armstrong, Childs, de Loutherbourg, Hilleström, labour, Liebermann, Meunier, Migliara, naturalism, painting, realism, Sisley, von Menzel, Weir, workers, Wright. Bookmark the permalink.